Hey everyone. 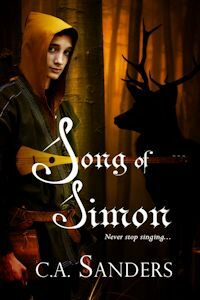 I just got an email from the artist that is doing the cover for “Song of Simon.” She sent me the final draft, and I like it a lot. It’s a different interpretation from how I pictured Simon–the boy looks more Latino than Irish–but there is a haunted look in his eyes that perfectly describes who Simon is. I am not too concerned with details. Details are less important than Truth. Also, I wouldn’t want to interfere with another artist’s interpretation. Seeing other people interpret your work is part of the fun (See my post on Fan Fiction). On Wednesday I finally got a CPAP Machine to help with my Sleep Apnea. The doctor said to try it a little at a time to get used to it, so I used it for an hour during the day yesterday. I used it for an hour this morning, and I was almost able to fall asleep. Maybe tonight I can go all the way and actually get to sleep. It makes me sad that I can’t wear my glasses with it on though. I need the full mask, and it just wasn’t made for glasses. Oh well, don’t need glasses to sleep. Next Wednesday, Mercy College is giving out a small award in Valerie’s name. I think that the award goes to either the top student in the writing department, or the winning story in a contest. Either way, I am happy about it. Even if years in the future, people no longer know who she was, she will still be helping her students. I remember when I was a senior, I was runner up for a similar contest. I only won a gift certificate, but it gave me the confidence I needed. Maybe my writing wasn’t as terrible as I thought. The encouragement is more valuable than the prize. This entry was posted in Comics/Books, Personal Life, Writing and tagged apnea, cpap, health, mercy college, promotions, song of simon, valerie, writing by C. A. Sanders. Bookmark the permalink. Hi. Sorry to hear you need CPAP. I’ve been going through sorting it out and had a really problem with my first full face mask. It gave me a pressure sore on my nose. You should be able to wear your glasses with it.